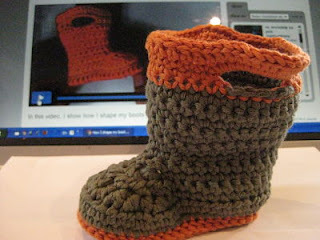 I'm making booties, Welly booties! And they are coming along great.. I mean, I'm actually reading and crocheting from a pattern!! (amazing) What pattern? 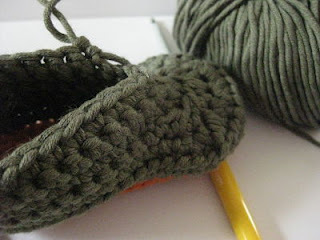 This pattern: The Lovely Crow's Baby Goshalosh Boots. What makes this pattern uber special is not just the design of the booties but the accompanying video tutorials with it .. yes! It goes like this... I read the pattern & think hmm... then I check out the video tut's & think.. yep! Try it for myself, look at video again...and do it! Awesome!! What is also brilliant is that the pattern creator herself has this amazing calming voice when explaining the technique which I found very soothing. Have you ever been taught something by someone only to have the huff at you, sigh & then grab the piece away so they can do it for you.... well there's none of that here!!! 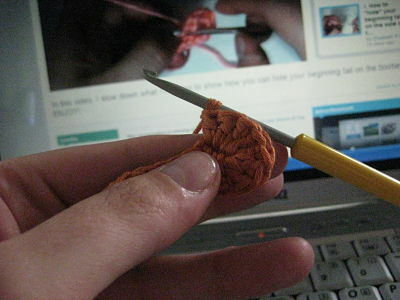 Have you made booties? Have you made this pattern? Want this pattern then click here. 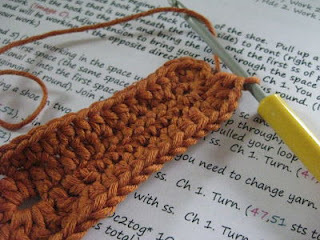 And yes, if you are too observant, you will notice there is a little bit of a 'user' error in the top orange rim, but I'll copy this mistake into the second bootie so they'll match!! you are too cool! love the colors! Well done on completing the pattern. The boots are really cute. Love these -- yay for Wellies!